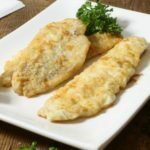 Keyword how do you know when haddock is cooked?, how do you pan fry haddock? Remove the fillets of haddock from the fridge, and set aside. In a separate bowl, mix together one cup of all purpose flour, and seasonings. My go to spice mixture is 2 tsp onion powder, 1 tsp garlic powder, 1 tsp salt, 1/2 tsp black pepper. Place the haddock fillets directly in the flour mixture and coat liberally. Heat oil or clarified butter in a pan on the stove over medium high heat. Allow the oil to heat up and become 'slick' looking. Add the seasoned fish fillet to the hot oil, making sure to first shake off any excess flour first. The fish should start to sizzle as soon as it touches the pan. Do not attempt to shake or move the fish once it is in the hot pan. Let the fish fry in the pan without moving it until you start to see the edges brown. If you let the oil heat up properly in step 3 before adding the fish, the fillet will 'release' from the pan once it has sufficiently been seared. Use a metal spatula to gently lift an edge of the fried haddock to test if it lets go of the pan. When the fish can be easily lifted, flip the fillet by turning it over onto a 'new section' of the hot frying pan, making sure there is hot oil underneath it. Repeat step 5.